A video grab of the image shown on TV as the VAR reviewed Jan Mata’s goal. 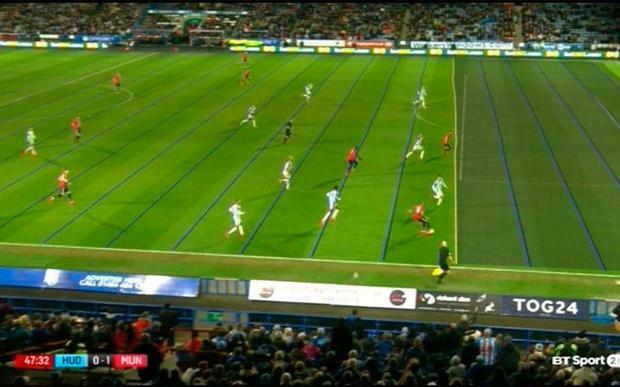 Controversy surrounding wavy lines is not what we signed up for with VAR. The events around Juan Mata's disallowed goal exposed flaws in the system and I believe that the referee's original decision to allow the goal should have stood. But we are all in a learning process here and no-one should give up just yet on a system I have long supported. The beauty of an experiment is that we can make tweaks - and the need for change is already apparent. Saturday's review made me wonder how far we can trust the technology to arrive at incontestable decisions, which is strange given that is the point of it. Although the boffins are seeking to explain away as a broadcasting error the waves depicting the offside line on our screens, more clarity is needed, particularly when - as in Mata's case - we are talking kneecaps. Is the technology really up to the job? The line they draw must be parallel with the penalty area and in line with the second most rearmost defender, which is a difficult task given how defences move. We need more proof that they are getting this right. And, like referees, the technology must judge instantly, not five minutes after everyone has gone home.